Improving your approach to decision making starts with understanding what may be fueling it. 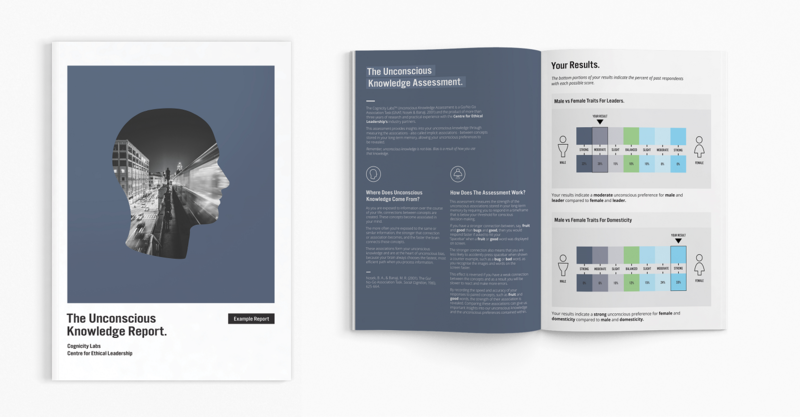 Our flagship tool is based on the Go/No Go Association Task (GNAT, Nosek & Banaji, 2001), developed for gaining meaningful insights into an individual’s unconscious knowledge. A 12 minute commitment of time and an immediate download of a comprehensive personalized report with a background to the measure, explanations and implications. Group profile reports are available for over 10 participants. Gaining insight into your strength of implicit association raises general awareness and increases acceptance of unconscious knowledge and potential for bias. Cognicity takes that insight further to detail implications of individual profiles for key decisions and judgements such as participation on a selection panel. Based on research into the protective and risk factors for diversity in teams and their impacts on outcomes (intention to leave, engagement, productivity, etc.) our Organisation Diversity scan can be deployed in broad or specific ways. Outputs include a comparison of different sub-group ratings of risk and protective factors (male versus female, minorities, etc.) and the impacts on outcomes of interest to the team and provide a basis for establishing or refocusing strategies to improve diversity outcomes. A three month follow up is used to test for follow through on strategies and changes in the protective and risk factors. The Diversity Scan enables you to measure the predictive and risk factors that research has shown to influence women’s ability to “fit”,to perform well (function) and to develop and grow in an organisation. It can also be adapted for use with minority groups. The factors and items used in the scale are research validated. Reports enable organisations to understand a set of detailed contributing factors in each category and to see where differences between genders is most significant.